The Airforce 1 Evo is an attractive pilots watch, which derives its name from the President of the United States personal aircraft. With a modest (black PVD treated) 316L stainless steel case measuring 41.5mm x 13mm the watch is designed to make a subtle statement. What makes this timepiece so extraordinary is the meticulous attention to detail. The elegant sliver dial works in perfect contrast with the black numerals, indexes and sub counters. Other impressive details include a rotating bezel (with flight calculator), anti-reflective sapphire crystal lens and (black PVD treated) steel bracelet. 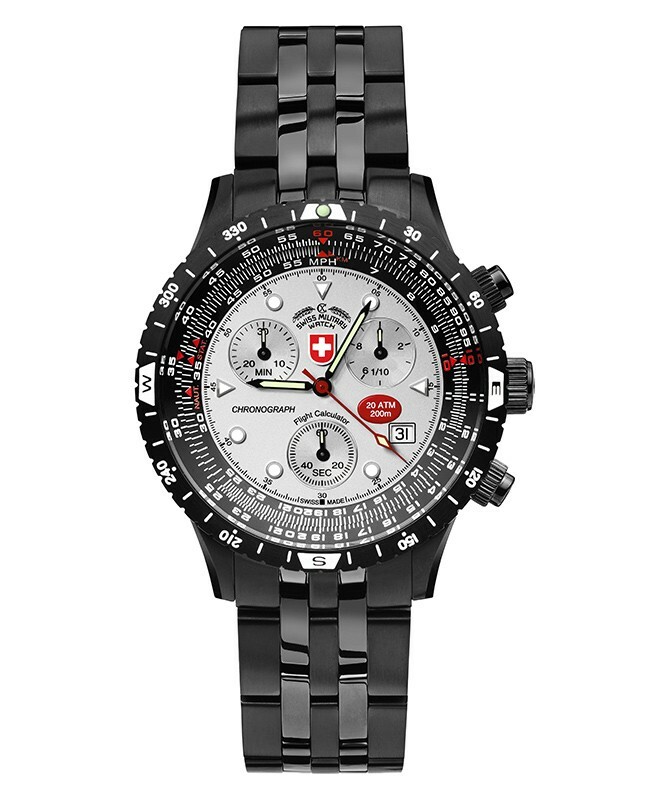 At the heart of the watch is Swiss made 13-jewel Ronda 5030D quartz movement. The AIRFORCE I is the US president’s aircraft. When the President is aboard the AIRFORCE I the radio call sign is "Air Force One" – hence the name. While on the aircraft, the President and staff have access to a full range of services, including communications systems, secure and non-secure voice, fax and data communications, along with access to photocopying, printing, and word processing. These aircraft are maintained and operated by the Presidential Airlift Group, part of Air Mobility Command´s 89th Airlift Wing, based at Andrews Air Force Base, Suitland, Maryland/USA. The VC-25A is capable of flying half way around the world without refueling and can accommodate more than 70 passengers. 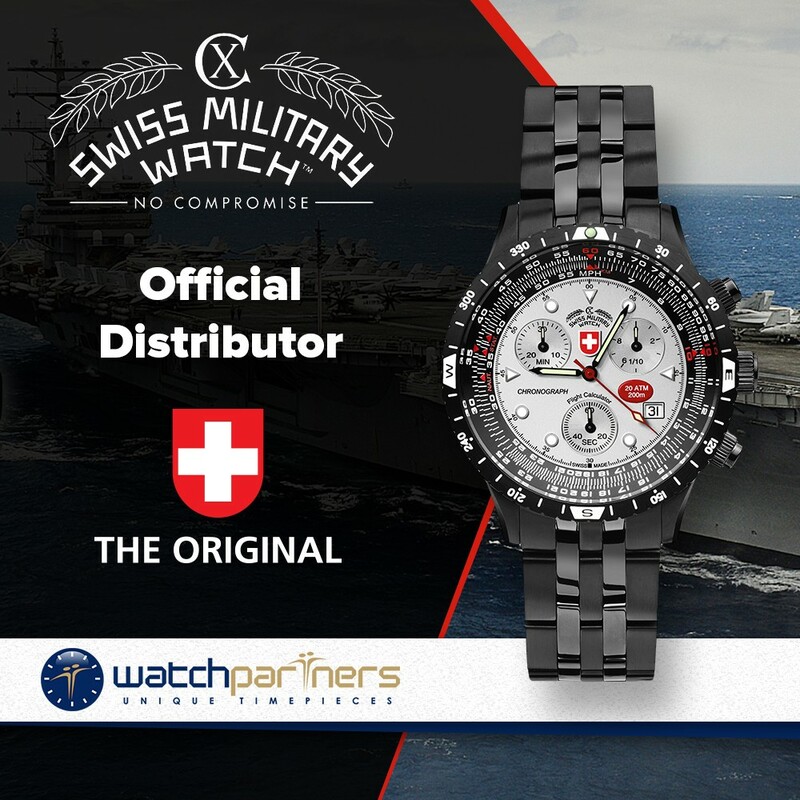 CX SWISS MILITARY™’S AIRFORCE I was designed to meet the extremely high standards of the equipment that is being used in such aircrafts as the US Airforce I. Only choice materials may be used in the production process and strict quality control on several production levels is paramount. The AIRFORCE I timepiece is a high-end chronograph equipped with a multi-purpose slide-rule to allow aviatic and nautical calculations. A certified water resistance of 200m ensures your watch will not let you down, whatever situation you might find yourself in. The Airforce 1 EVO features a stainless steel case & bracelet with a black PVD coating.